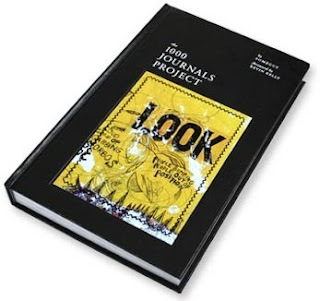 Most of us have heard of the 1000 Journals project by now. It started nearly a decade ago, in San Francisco. For those who might need a refresher, "The 1000 Journals Project is an ongoing collaborative experiment attempting to follow 1000 journals throughout their travels. The goal is to provide a method for interaction and shared creativity among friends and strangers." So, 1000 journals were sent out in the world. People added to them, little by little, sharing thoughts and inspiring each other. Think of it as a mobile version of bathroom wall graffiti, which in part sparked the idea for this. Last year, a book was released containing snippets from the journals that made it back. A documentary about the project! It premiered at the Roxie Theater in San Francisco at the beginning of the month, and will slowly be making its way around the world from there. The NY screening is apparently at HDFest in October; I signed up for e-mail updates. A few hours later, I got a personal email from the producer/director of the film herself, Andrea Kreuzhage. She thanked me for signing up and pointed me towards 1001 Journals, a type of 1000 Journals extension in which I can participate. Wow! I am so excited. Being a natural gatherer who has been journaling /pasting things into books for the past 19 years... I'm totally excited for this. I am going to close with some voiceover from the documentary trailer that was so true and inspiring that I felt like jumping out of the window (in a good way). What happened to us; where did our creativity go? If you ask a group of Kindergarteners, "Raise your hands if you're an artist," every single one of them will raise their hands. And you can ask the same question of a group of sixth graders, and maybe a few of them will raise their hands. And then you ask the same question of a group of high school seniors. And you'd be lucky to get one or two of them to raise their hands. What happened? We were all creative people at one point in our lives, and now we all go to work every day and sit in traffic. Click here for a bunch of related links & how to find the 1000 Journals film all over the web.